The Adventures of Tom Sawyer, by Mark Twain, is a popular 1876 novel about a young boy growing up in the Antebellum South on the Mississippi River in the fictional town of St. Petersburg, Missouri. 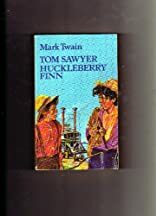 Adventures of Huckleberry Finn (1884) (often shortened to Huck Finn) by Mark Twain is commonly accounted as one of the first Great American Novels. It is also one of the first major American novels ever written using Local Color Regionalism, or vernacular, told in the first person by the eponymous Huckleberry "Huck" Finn, best friend of Tom Sawyer and hero of three other Mark Twain books.- Excerpted from Wikipedia, the free encyclopedia.